Life with a Wiener Dog: VC Rocks Celebrate Today! Welcome to the July 2015 Birthday Blog Hop! This summer is VC Rocks 15th birthday! I know I've been a member for ten of those years (maybe even 11) and I've made wonderful friends during that time! 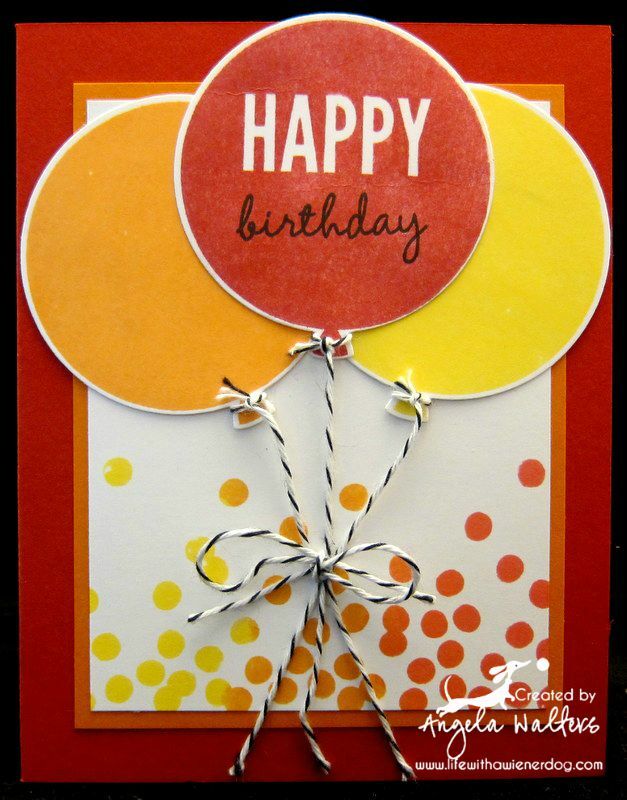 This blog hop will feature birthday wishes projects, all featuring Stampin' Up products. To see all of the projects along the hop, you can start at the VC Rocks blog by clicking here. Click on a project to go to each person's blog where you can see a larger picture and get more details about each of their fabulous designs. The ladies in this group are very talented, so I highly suggest you check out their projects! I know many of you started following my blog when I was a Stampin' Up demonstrator so you'll be happy to see I have not forgotten my Stampin' Up roots! That is where my stamping life began and I will always be grateful to Stampin' Up for the terrific friends I've met and the fantastic hobby I love! For this card, I stamped my balloons from Celebrate Today and cut them out with the corresponding Balloons framelits. I put a little bit of Real Red, Pumpkin Pie and Daffodil Delight inks on my Dotty Angles stamp to create the fun background on the white card stock below. I made my balloon strings out of Basic Black Baker's Twine and then tied the strings together with another piece of baker's twine into a bow. I like it when the strings are tied together as a finishing touch. This is a fun card and I think it would be great to mass produce it to have on hand when a birthday pops up! Just don't "pop" the balloons! Don't forget to check out the other blog hop participants at VC Rocks Blog! The love color combo and the way you colored the Dotty Angles stamp! Thanks for joining in the blog hop! I love your card Angela. You have inspired me! Thank you! What a great birthday card! Thanks for joining our hop! Love the card; the bright colours are so festive. Festive card...love the colors and those giant balloons! I love it. I think I need this set and the thinlits. Lovely colors and design. I may have to get this set.